With “The Hunger Games” poised to be the one of 2012’s most anticipated films, Hollywood’s also got a taste for Amandla Stenberg. The 13-year-old actress nabbed the plumb role of Rue (a young "tribute" who teams up with main character Katniss Everdeen, played by Jennifer Lawrence) in the big screen adaptation of Suzanne Collin’s sci-fi young adult novel after stints in “Columbiana” and the Hallmark telepic “A Taste of Romance” and stints as a child model, commercial actress and voice performer. Stenberg gives PopcornBiz an early taste of her time on the battleground. With everyone so eagerly anticipating “The Hunger Games,” what was the experience making the first film like for you? I think the entire experience – I just couldn't believe it and I STILL can't believe it. I don't think I will until the movie comes out, because I'm so honored to be playing Rue and it was incredible. How seriously did you prepare for the role and try to get into Rue’s head? I think I'd read the books at least four times, and so I read it a fifth time when I heard that I was cast. I went through and made all these sticky notes, and it was this giant deal. I was always reading the book. I prepared as much as I could and I hope that I did a great job. Did Rue already happen to be your favorite character from the books? My two favorite characters were Foxface and Rue. When I read about Rue, at first I didn't really picture myself as her, but then the more that I read it I thought, 'Wow. This is an amazing character. It would be such an honor if I got to play her.' So, I think that's what really made me so excited about playing her. How intense did things get for you during filming? Anything you had to work your courage up to do? I don't know about that, but there are lots of crazy things in the movie. Once I got stung by bees – not as a part of the movie, but I just got stung! So that was something I had to overcome, but I don't think that there's anything that traumatic. Despite the differences in your ages, did you and your cast mates form a tight bond? Definitely! We were going to get sushi every night and going swimming. It was super fun. We all learned from each other. We weren't separated by our ages at all. We just became one big family and I definitely think that all the older actors and actresses that I worked with really became my role models – and also kind of like my big brother and sister figures, too. How faithful will the film be to the first book? Well, I'm not even sure because I haven't seen the movie, but I think it's pretty phenomenal. We'll just have to wait and see in March! Who are your personal acting role models? I love Audrey Hepburn, because she was a humanitarian, and I also love Anne Hathaway. Those are my two favorite actresses. I think Anne's a great actress, and I really enjoy the films that she's been in, like 'The Devil Wears Prada.' That's one of my favorite movies. I really just like what she's done with her career. 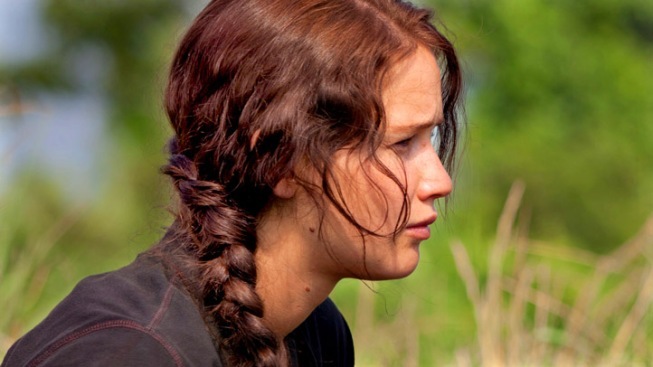 "The Hunger Games" arrives March 23rd, not that you'll be able to miss it.